There is an awesome new Dole Coleslaw Coupon available. The coupon is for $0.50 off any Dole Coleslaw Kit. Stop & Shop has the Dole Coleslaw on sale for $1.00 each. 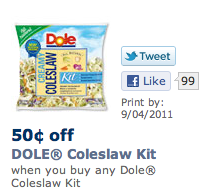 I don’t know if the Coleslaw Kit is included in that so you might want to take the along a coupon just in case. Usually these kits are more money then the regular bags so it’s probably not included, but hey, you never know.